Three helicopters touched down on The Green in Ballinrobe, Co Mayo on Sunday the 4th of October, 1970. They carried United States Secret Service Staff, White House aides, the Press Corps and America’s First Lady, Mrs. Pat Nixon, the wife of then U.S. President Richard Milhouse Nixon. 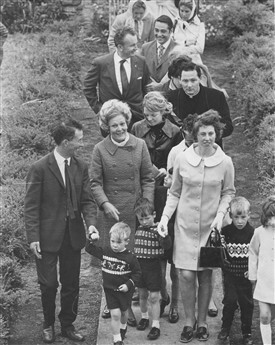 Mrs. Nixon had accompanied her husband on a trip to Europe and while in Ireland for a few days it was arranged that she would come to Mayo to visit distant cousins still living in the ancestral homeland of her paternal grandparents. The First Lady and her entourage were warmly greeted by a special committee of Ballinrobe townsfolk and a boy's brass band from Galway. She was presented with flowers and a crystal vase as welcoming gifts. Mrs. Nixon’s paternal grandparents, Patrick Sarsfield Ryan and Catherine McHugh had left for America shortly after marrying in nearby Robeen chapel. One of their sons, William Ryan, who was born in Connecticut in 1866, was Pat’s father. Born the day before St. Patrick’s Day in 1912, Thelma "Pat" Ryan was known to be extremely proud of her Irish roots. Some of the cousins whom she met with that day were Mrs. Catherine Naughton (Lynch’s Acres, Ballygarries), Mr. Joe Fahey (Robeen, Hollymount), Mrs. P. Cusack (Loughmask), Mrs. J. McTigue (New Street, Ballinrobe), Mr. James Cunningham (Hollymount) and Mrs. Annie Walsh who led a reception for Mrs. Nixon at Robeen Church. Her visit included a trip to the Ryan ancestral homestead in Kilvindoney and to Robeen cemetery where her ancestors are buried. It ended with a luncheon that included all of her cousins at Ashford Castle. 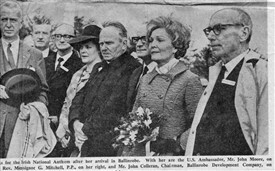 On the way back to Ballinrobe for her scheduled departure Mrs. Nixon made stops to greet small crowds who gathered along the roadside to catch a glimpse of the President’s wife. It has been said that not until Hilary Clinton became First Lady in 1993 did a First Lady travel the globe more than Pat Nixon. 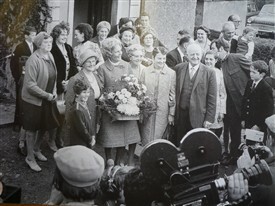 And though other First Ladies with Irish roots have visited Ireland, most recently, Michele Obama, no other First Lady has made an attempt to connect with their distant Irish relatives as Pat Nixon did on that October day in 1970. This page was added by Averil Staunton on 22/03/2014.